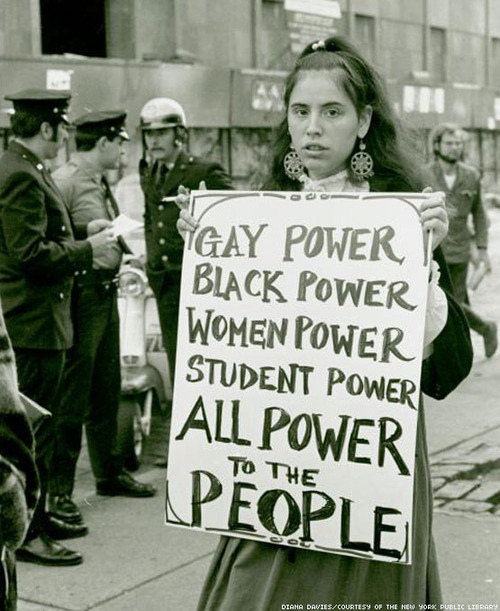 all power to the people | What's that you said? She could be a present day Occupy protester! Except, perhaps, for the cigarrette in hand 🙂 This photo was taken in 1970! Protestor at Weinstein Hall demonstration for the rights of gay people on the NYU campus, 1970 (Photograph by Diana Davies, Diana Davies Papers), NY Public Library Schwartzman Research Branch, “1969: The Year of Gay Liberation” exhibit (source — this article itself is also well worth a read). This entry was posted in history, queer, visual imagery and tagged protests. Bookmark the permalink.